George Edward (Rube) Waddell (October 13, 1876 – April 1, 1914) was an American southpaw pitcher in Major League Baseball (MLB). In his thirteen-year career he played for the Louisville Colonels (1897, 1899), Pittsburgh Pirates (1900–01) and Chicago Orphans (1901) in the National League, and the Philadelphia Athletics (1902–07) and St. Louis Browns (1908–10) in the American League. Born in Bradford, Pennsylvania, Waddell was elected to the Baseball Hall of Fame in 1946. Waddell was a remarkably dominant strikeout pitcher in an era when batters mostly slapped at the ball to get singles. He had an excellent fastball, a sharp-breaking curve, a screwball, and superb control (his strikeout-to-walk ratio was almost 3-to-1). He led the major leagues in strikeouts for six consecutive years. Born in 1876 outside of Bradford, Pennsylvania, Waddell grew up in the country. Biographer Alan Levy writes that Waddell was "a decidedly different sort of child." At the age of three, he wandered over to a local fire station and stayed for several days. Waddell did not attend school very often, but he was considered to be literate. He strengthened his arm as a child by throwing rocks he encountered while plowing the family's land. He also worked on mining and drilling sites as a youngster, which helped his conditioning. Waddell's career wound through a number of teams. Waddell was unpredictable — early in his career he left the mound mid-game to go fishing. He had a longstanding fascination with fire trucks and had run off the field to chase after them during games. He performed as an alligator wrestler in the offseason. He was easily distracted by opposing fans who held up puppies and shiny objects, which seemed to put him in a trance on the mound. An alcoholic for much of his short adult life, Waddell reportedly spent his entire first signing bonus on a drinking binge (Sporting News called him "the sousepaw"). Waddell's eccentric behavior led to constant battles with his managers and scuffles with bad-tempered teammates. His first pro contract was with Louisville (for $500), pitching two league games and a couple of exhibitions with the team at the end of the 1897 season. When the season ended, he was loaned to the Detroit Wolverines of the Western League to gain professional seasoning. After defaulting on rent and being fined by owner George von der Beck, Waddell left Detroit in late May to pitch in Canada before eventually returning to Homestead, Pennsylvania to pitch semi-pro baseball there. Pittsburgh retained his rights, however, and he was loaned to Columbus of the Western League in 1899, continued with the team when the franchise moved mid-season to Grand Rapids, and finished with a record of 26–8. He rejoined Louisville in the final month of the 1899 season and won seven of nine decisions. When the National League contracted to eight teams for the 1900 season, Louisville ownership bought the Pittsburgh franchise and the Louisville franchise was terminated. Louisville's top players, including Waddell, Honus Wagner, Fred Clarke and others, were transferred to Pittsburgh. 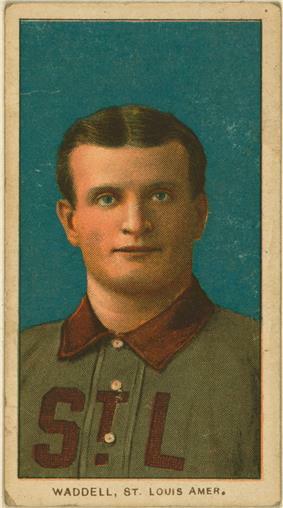 Waddell debuted with the Pittsburgh Pirates in 1900, leading the National League (NL) in ERA. On August 19, Waddell pitched the first game of a doubleheader for Milwaukee, winning in the 17th inning on his own triple. His manager, Connie Mack, offered Waddell a three-day fishing vacation if he agreed to pitch the second game, which had been shortened to 5 innings. Waddell threw 5 scoreless innings for the victory, and headed to Pewaukee Lake for fishing. However, his erratic behavior led manager Fred Clarke to suspend him. After pitching semi-pro ball in small towns such as Punxsutawney, Connie Mack learned of Waddell's availability, and with Pittsburgh's approval convinced Waddell to pitch for Milwaukee for several weeks in the summer of 1900. Milwaukee was in the newly named American League (AL), formerly known as the Western League, which was not yet directly competing with the NL. When Waddell displayed his prowess for Milwaukee, Pittsburgh management asked for Rube's return. By 1901, he had worn out his welcome and his contract was sold to the Chicago Cubs, then managed by Tom Loftus. The manager had previous success with Waddell in Columbus/Grand Rapids, but he did not have the latitude to cope with Waddell's problems as the Cubs manager. When problems led to his suspension, Waddell began pitching for semi-pro teams in northern Illinois, as well as Racine and Kenosha, Wisconsin. Frank Chance and Joe Cantillon then invited Waddell to join a barnstorming team that travelled to California, where he was convinced to stay and joined the Los Angeles Loo Loos in a league that a year later would become the Pacific Coast League. Connie Mack, now in Philadelphia, was desperate for pitching, and when he learned Rube was pitching in California, he dispatched two Pinkerton agents to sneak Waddell back to Philadelphia, where he led the Philadelphia Athletics to the 1902 American League crown. Much later, Mack described his star left-hander as, "...the atom bomb of baseball long before the atom bomb was discovered." On July 1, 1902, Waddell became the second pitcher to strike out three batters on nine pitches, in the third inning of a 2–0 win over the Baltimore Orioles. Shortly after the 1902 baseball season, reports indicated Waddell would play for Connie Mack's Athletics football team. However, he never played for the football Athletics. "There was a little fellow from Wanamaker's [department store] who asked for the job of quarterback," Mack said. "I don't think he weighed more than 140. Well, the first practice Waddell tackled him and broke [the little fellow's] leg. It was the first inkling John [Shibe] and I had that players could be badly hurt in football. We got Rube out of there without delay. He was supposed to be pretty good, but we never found out." Waddell returned to his family's home in Western Pennsylvania and played with local football clubs there. Waddell played with various football teams in later years and had a brief stint as a goalkeeper in the St. Louis Soccer League. In his prime, Waddell was the game's premier power pitcher, with 302 strikeouts in 1903, 115 more than runner-up Bill Donovan. According to baseball historian Lee Allen in The American League Story, Waddell began the 1903 season "sleeping in a firehouse at Camden, New Jersey, and ended it tending bar in a saloon in Wheeling, West Virginia. In between those events, he won 22 games for the Philadelphia Athletics, toured the nation in a melodrama called The Stain of Guilt, courted, married and became separated from May Wynne Skinner of Lynn, Massachusetts, saved a woman from drowning, accidentally shot a friend through the hand, and was bitten by a lion." In Eliot Asinof's 1963 account of the 1919 World Series fix "Eight Men Out", mention is made of Waddell being bribed to not pitch in the 1905 World Series against the New York Giants. Further discussion of the 1905 World Series has taken place at SABR. Waddell followed that season with 349 strikeouts in 1904, 110 more than runner-up Jack Chesbro. No other pitcher compiled consecutive 300-strikeout seasons until Sandy Koufax in 1965 and 1966. Waddell was the opposing pitcher for Cy Young's perfect game on May 5, 1904, and hit a flyball for the final out. Waddell's 349 strikeouts represented the modern-era season record for more than 60 years, and remains sixth on the modern list. In 1946, it was initially believed that Bob Feller's 348 strikeouts had broken Waddell's single-season mark, but research into his 1904 season box scores revealed uncounted strikeouts that lifted him back above Feller. Waddell still holds the AL single-season strikeout record by a left-handed pitcher. In 1905, Waddell won a triple crown for pitching, finishing with a 27–10 win-loss record, 287 strikeouts and a 1.48 earned run average (ERA). It was Waddell's fourth consecutive season to finish with 20 or more wins. His drinking problem was exacerbated by a horrific marriage to May Wynne Skinner (his second of three wives) and a series of injuries in 1905 and 1906. In time, his alcohol use began to erode his relationships with his Athletics teammates. Catcher Ossee Schreckengost, a one-time friend who regularly fetched alcohol and fishing poles for Waddell, squabbled with both Waddell and Mack for being treated differently for the same offenses. Complaints from teammates forced Mack to send Waddell to the St. Louis Browns for $5,000 in early 1908 despite his continued success. Recent commentators (such as Bill James) have suggested that Waddell may have suffered from a developmental disability, mental retardation, autism, or attention deficit disorder (ADD). Not much was known about these mental conditions, or their diagnoses, at that time. Though eccentric and childlike, Waddell was not illiterate (as some sources have claimed), although Ken Burns' baseball documentary claimed he lost track of how many women he had married. To make sure he stayed out of trouble during the offseason, Browns owner Robert Hedges hired him as a hunter over the winters of 1908 and 1909. He set the league record for strikeouts in a game (16) in 1908. However, further drinking and marital problems with his third wife, Madge Maguire, led to his release in 1910. He finished the season pitching with "Iron Man" Joe McGinnity for Newark in the Eastern League, and never played another major league game. His career stats were 193–143, 2,316 strikeouts, and a 2.16 earned run average, with 50 shutouts and 261 complete games in 2961 innings pitched. After his major league career was over, Waddell pitched for parts of three more years in the minor leagues, including a 20-win season for the Minneapolis Millers in 1911. In addition to pitching for the Millers, he pitched for the Minneapolis Rough Riders and with Virginia (MN) in the Northern League in 1913. By that season, however, his health had declined to such an extent that he no longer resembled the muscular, long-limbed hero of the prior decade. While in spring training with the Millers, Waddell helped save the city of Hickman, Kentucky from a devastating flood in the spring of 1912. Catching pneumonia, he lost much of the vitality that had sustained him; and a second flood in Hickman and another ensuing case of pneumonia in 1913 took the rest. While in Minneapolis in 1913, he was diagnosed with tuberculosis, and was eventually sent to live with his sister in San Antonio, Texas. His health never recovered, and he was placed in a sanitarium until his death on April 1, 1914 at the age of 37. Waddell was elected to the Baseball Hall of Fame in 1946 by a veterans' committee that looked to enshrine a number of players from his era and the previous century who had contributed to the growth of the game. One of Waddell's contributions was that he was perhaps the greatest drawing card in the first decade of the century, a man whose unique talents and personality drew baseball fans around the country to ball parks. In 1981, Lawrence Ritter and Donald Honig included him in their book The 100 Greatest Baseball Players of All Time. Under what they called "the Smoky Joe Wood Syndrome," they argued in favor of including players of truly exceptional talent whose career was curtailed by injury (or, in Waddell's case, substance abuse), despite not having had career statistics that would quantitatively rank them with the all-time greats. In this case, Waddell was already recognized by fans and peers as a baseball great long before Ritter and Honig did. Waddell's pitching repertoire usually consisted of only two pitches: one of the fastest fastballs in the league and a hard curve. But he had command of many more pitches, including slow curves, screwballs, "fadeaways" and even a "flutterball". Mack once said that Waddell's curve was, "even better than his speed... [He] had the fastest and deepest curve I've ever seen." Waddell enjoyed waving his teammates off the field and then striking out the side. He actually did so only in exhibition games, since the rules prohibit playing with fewer than nine men on the field in regulation play. But in a league game in Detroit, Waddell actually had his outfielders come in close and sit down on the grass to watch him strike out the side. Once the stunt almost backfired. Pitching an exhibition game in Memphis, he took the field alone with his catcher, Doc Powers, for the last three innings. With two out in the ninth, Powers dropped the third strike, allowing the batter to reach first. The next two hitters blooped pop flies that fell just behind the mound. Waddell ran himself ragged, but finally fanned the last man. ^ a b Levy, pp. 9-10. ^ Macht, Norman L. (2007). Connie Mack and the Early Years of Baseball. University of Nebraska Press. p. 312. ^ Ward, Geoffrey C.; Burns, Ken (1994). Baseball: An Illustrated History. A. A. Knopf. p. 74. ^ Allen, Lee & Meany, Tom. Kings of the Diamond, 1965. Levy, Alan H. (2013). 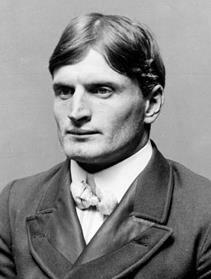 Rube Waddell: The Zany, Brilliant Life of a Strikeout Artist. McFarland. ISBN 9780786407866.